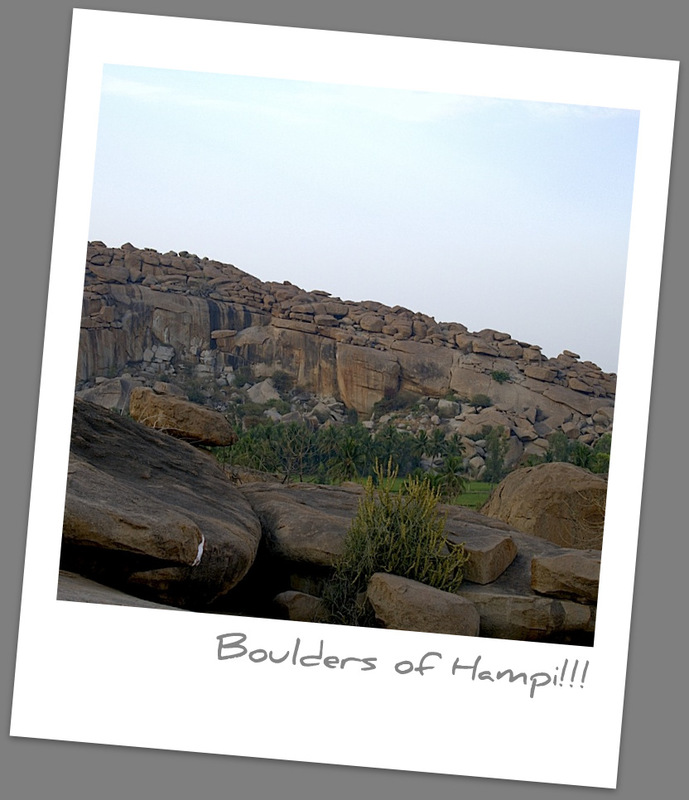 26th March 2011 – Ever since I bought the Outlook traveller book – 52 weekends around Bangalore; Hampi has been on top of my list. The writer of that article describes Hampi as a soul amidst the ruins!! 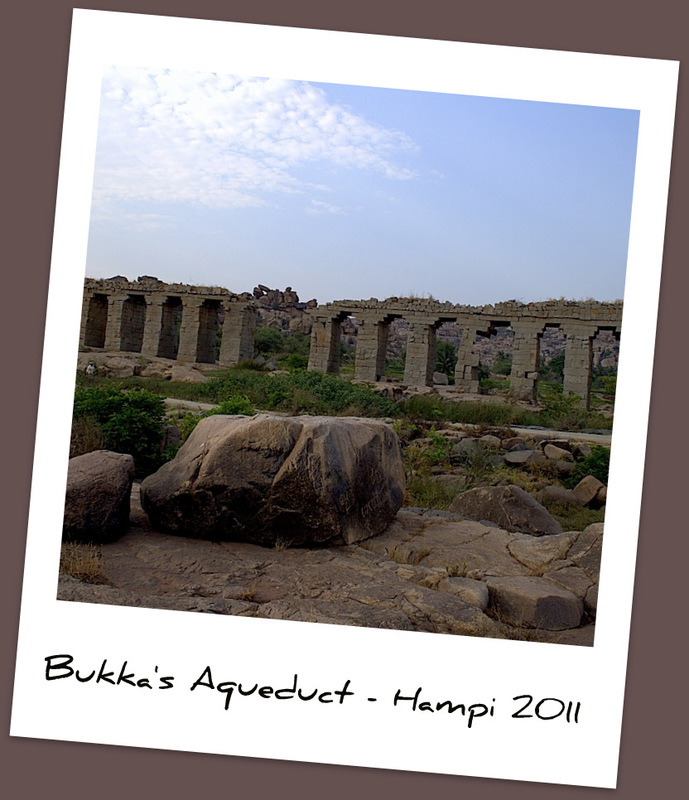 I borrowed the line to title my blog as I feel it very aptly captures the entire essence of Hampi. 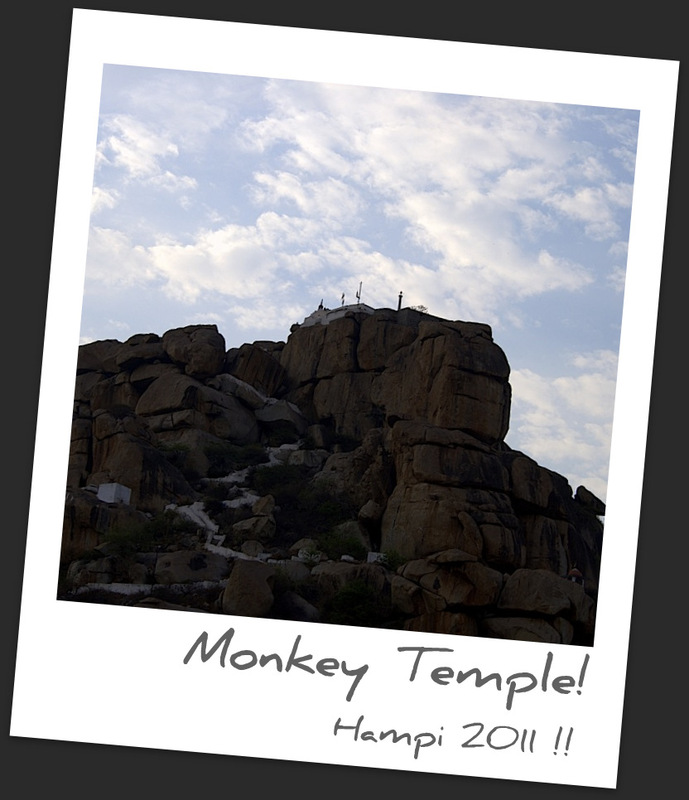 The history of Hampi begins as the monkey kingdom or Kishkindha from Ramayana where Lord Rama met Hanuman. Infact there is a monkey temple atop a hillock which is fabled to be the spot where Hanuman prayed before leaping over to Lanka. Later this was the Vijayanagara kingdom; noted King was Krishnadeva Raya of the Tuluva dynasty who was a great patron of art and architecture which is evident in the ruins that are Hampi today. 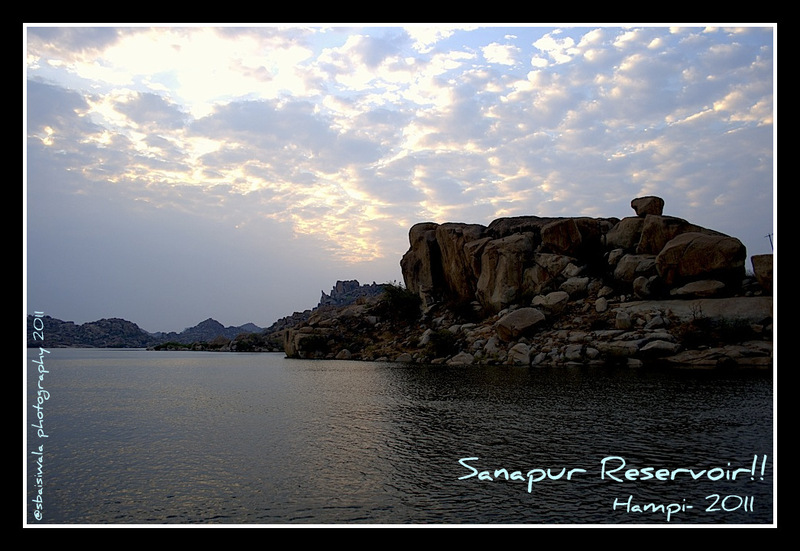 Many of the important monuments of Hampi are credited to him. The empire peaked during his rule and was at his affluent best. But then war and mercenaries scavenged off Hampi’s affluence and turned it into the ruin that it is today. The entire site of Hampi is a World Heritage site with monuments strewn at every nook and corner of its 33 odd kms. 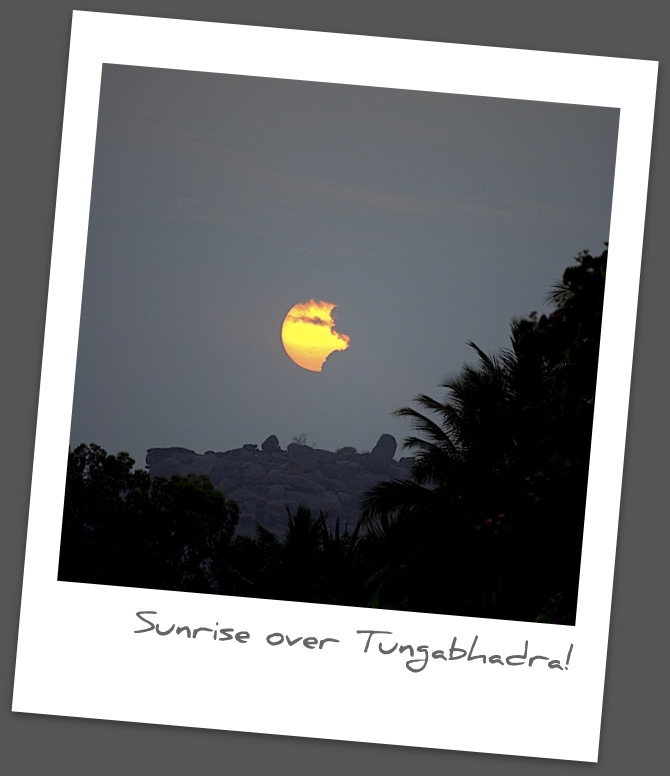 I finally got the chance to fulfill the dream last weekend when five of us headed to Hampi. The journey from Bangalore to Hospet lasted exactly 7 hours; we reached the Hospet Bus stand at 6.00 a.m. Then started the haggling with the swarm of auto drivers who descended on us even before we got off from the bus. The distance from Hospet to Hampi is about 13 kms and the autowallas started the amount at 150/-; we were able to get them to 100/- and then off we went. The idea was to go till the boat point on the river Tungabhadra from where we will go across to Virupapur Gadde to check out the guesthouse on that side. 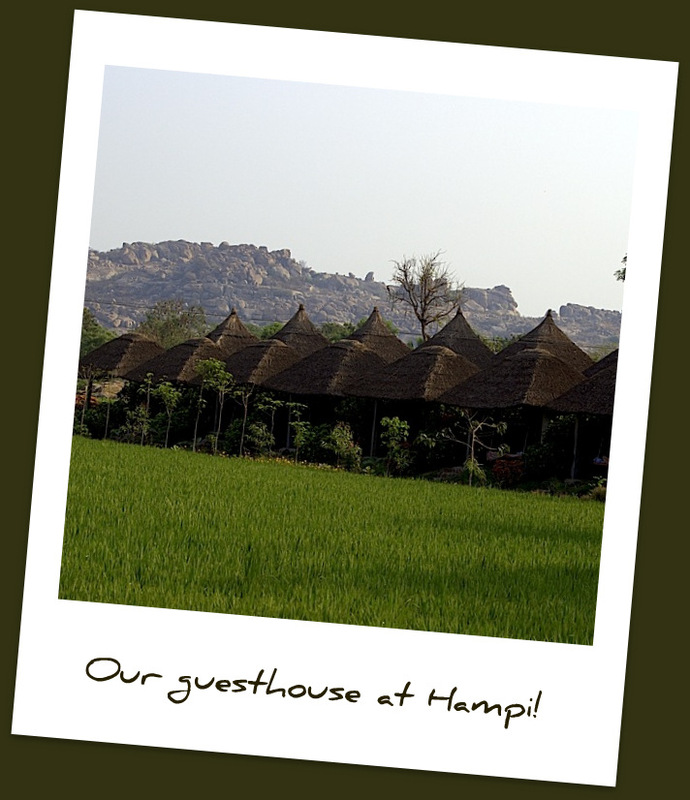 Many guidebooks and travel websites recommended staying across the river as the nicer accommodations are in that part of Hampi – all favoured by foreigners mostly. 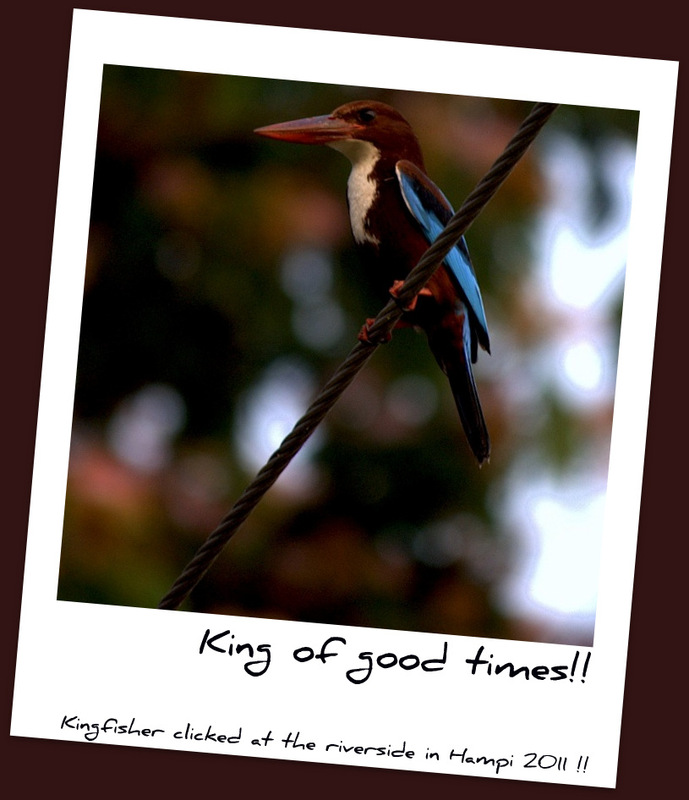 While we were waiting for the ferry to start, we spotted some kingfishers zipping around and immediately set to capture them – on camera!! It was a cloudy morning, on account of it having rained the night before – the weather was cool and breezy but any attempts to get the sunrise were foiled by the cloud cover. We got across and started the hunt; checked out Mowgli guesthouse first – quite dingy rooms and then checked out Shanti guesthouse right next to it – this one captured our imagination for its setting. The cottages were arrayed right before paddy fields which stretched out on two levels, beyond which we could see rows of coconut palms, and then the boulders and the river. The cottage rooms were with attached baths and a nice swing out on the verandah; which became our adda for the trip. The entire guesthouse was running full; mostly foreign guests. We ordered a scrumptious breakfast with paranthas and omlettes – all of it quite well made. But the fresh orange juice, cold coffee and hot tea were serious disasters – we stuck to coca cola there after. Sated, we decided to hang around this side of river and explore it first. We sat on the swing, gazed at the paddy fields and enjoyed the bird chatter; with occasional camera work whenever a bird got close to us. 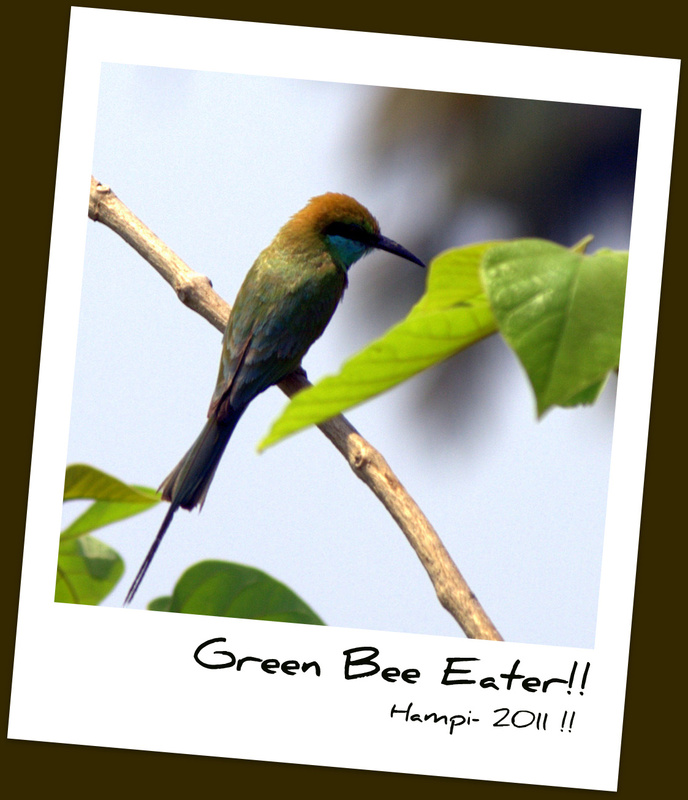 The number of birds amazed us – sunbirds, bee eater, kingfishers, wagtails, shrikes, etc. The whole thing of sitting on a swing, gabbing with friends and shooting the birds, had such a surreal feel to it. We hired some bikes and headed towards the attractions on this side of the river – the ancient aqueduct, monkey temple, sanapur reservoir, etc. Everywhere we looked we could see boulders perched atop hillocks; most looked ready to fall off with a slight whiff of air. We chanced upon a structure which looked like an ancient bridge to us but was in fact the Aqueduct. All that is left of it are some uneven arches and columns in dressed stones; some columns are so crooked by now, that a strong breeze might just knock it all down. 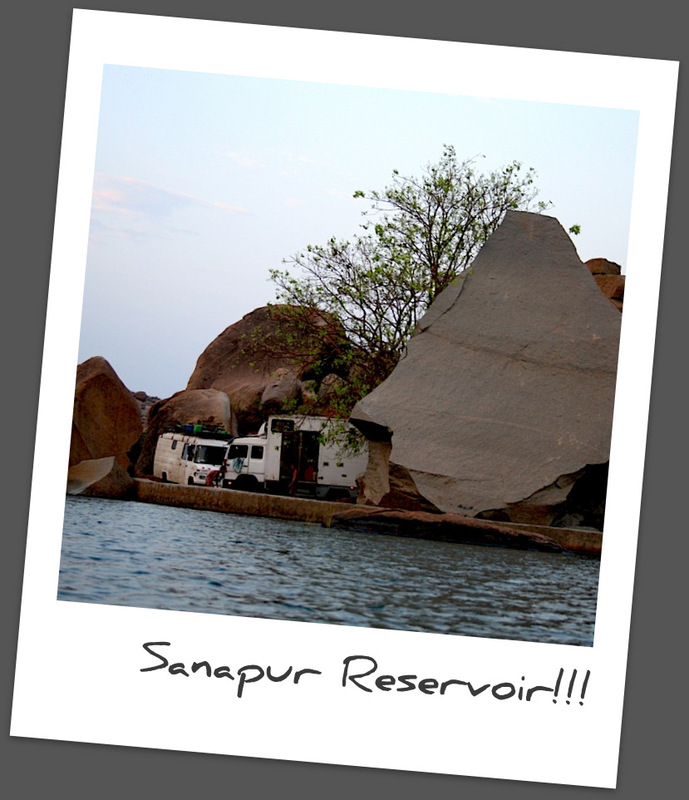 We drove through a village road to reach upto the walls of the Sanapur reservoir; its built on the riverTungabhadra, surrounded by the rocky forest on all sides. The reservoir was huge and full of clear water to the brim. We spotted a pair of caravans; belonged to a group of foreigners who appeared to have adopted the place as home. An old man with a coracle offered us a ride on the reservoir, which we gladly agreed to and had the time of our life. The calm and serene atmosphere of the reservoir was bewitching, making us wish we could stay longer there. We ended the day, with a long and lazy dinner in the sitout area. The glow of the lanterns was bewitching and lent a surreal look to the whole place. The food in this place was incredibly good; we tried the Indian and Chinese dishes mainly and were happy with the lot. 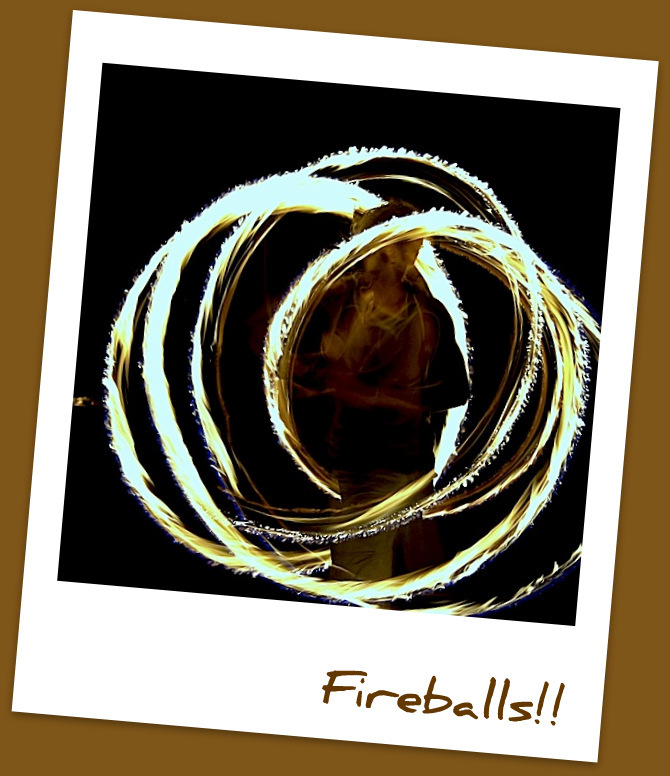 The entertainment for the evening was provided by a group of firangs playing with fireballs on strings and rotating them to drum beats. Their dexterity was applaudable, though the guesthouse staff was freaked out over it. 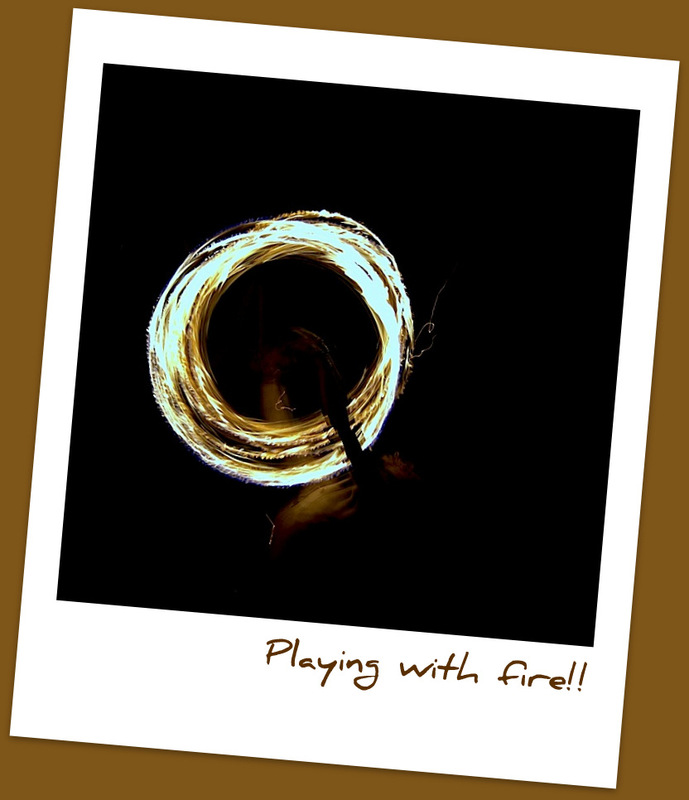 The thatched roof was dry and the staff was worried if a stray ember hit it; fire would start instantaneously. I tried photographing their antics and managed a couple of shots. Shanti guesthouse: yes it was a favoured haunt with the firangis but seemed they were satisfied with the low level of cleanliness the place had. Hardly any room or table was dusted/cleaned. The outdoor dining was a low seating area, overlooking the paddy fields and was pictureseque with the lights on at night. There was also dining area with tables and chairs but hardly anyone frequented it. The dining cloth on each table told the story of the meal before. The low seating covers were dirty with dust, food debris and rodent poo. The last row of cottages were the jackpot; others were with dingy toilets with almost no light or even proper fixtures. The shower in our toilet spewed water everywhere except…. This place was set so picturesquely but was dirty and ill-kept. Guess the firang crowds are not too fussy!! The river view room tarriff was 1200/- per night with the river barely visible but I recommend these rooms as the best in the house. Do carry some handwash, soap, shampoo and toilet paper roll as this is a very basic accommodation only. Ferry timings: 7.00 a.m. to 6.00 p.m.
Can you share details of Shanti guesthouse. I like the setup just next to a paddy field. Yeah it has the best setup over there – we checked out a few others too. Tell me what do you want to know about it? Contact details of the chap there? Or how do i book it? Hope this helps. Let me know if you need any additional info. Also, specify that you want the cottages on the end row – the ones with river view – the rest are not so good among the ones in the front. The ones at back are nice too but dont have the view and are cheaper therefore.